Birmingham boss Steve Bruce is weighing up his move for Charlton's Jason Euell after agreeing a fee of about £1.5m. 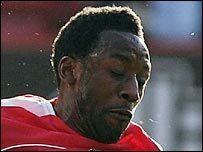 Euell, 28, was the Addicks' top scorer three seasons in a row but lost his place after a shoulder injury and a falling out with boss Alan Curbishley. Bruce told the Birmingham Mail: "With the money I have available, I have to consider things very carefully. "We've tracked Jason for some time but my fear is he has not played all season because of injury," he added. "I believe it's not a problem to him anymore, but you just don't know how long it might take before he's really up and running." Blues are hoping Euell will fill the gap left by Walter Pandiani's move to Espanyol and Emile Heskey's injury. They have already signed Chris Sutton to improve their poor scoring record. Birmingham are the joint lowest scorers in the Premiership, having managed just 15 goals in 21 Premiership games so far this season. Bruce added: "We have agreed a fee and we shall see what develops. "He is someone who has been an interest to us because of the goals he has scored from midfield areas. "He has got a good goalscoring record and the beauty about him is his versatility."